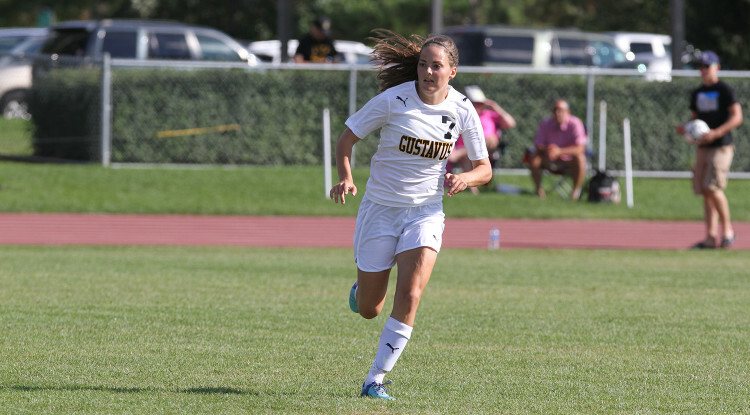 ST. PETER, Minn. – The Gustavus women’s soccer team Saturday shutout St. Olaf College 1-0 to improve to 2-3-1 overall and 2-0 in the Minnesota Intercollegiate Athletic Conference. The Gustie victory marks the first win over St. Olaf since 2008 and the first time since 2002 the Black and Gold started MIAC play 2-0. The Gusties put up the game’s only goal 7:53 into the match. Maddison Ackiss (Jr., Fairbanks, Alaska) scored her team-leading fifth goal of the season on an assist from Sophie Leininger (So., Plymouth, Minn.). The goal proved to be the game-winner – Ackiss’ second this week – as neither team could find the back of the net in the remaining 82 minutes. St. Olaf tallied 12 shots, while the Gusties posted nine. Keeper Ashley Becker (Fy., Farmington, Minn.) made three saves in her second-straight shutout win. Gustavus returns to action at 4 p.m. on Sept. 23 as it hosts the University of Wisconsin-River Falls.